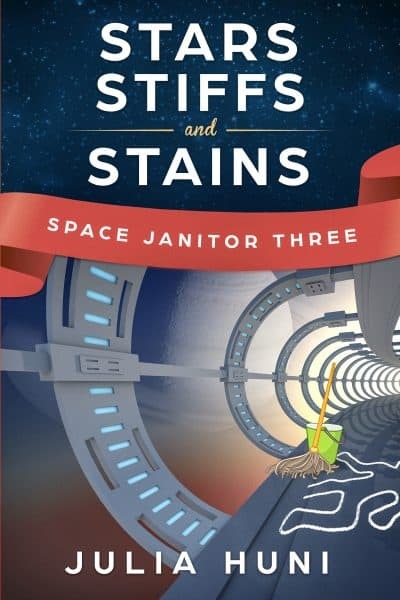 Cleaning the galaxy, one cruise ship at a time. Not content with stirring up trouble on her station or planet, Triana heads to the stars on a luxury cruise liner. When maintenance technician Triana Moore gets temporarily transferred to a passenger liner, she doesn't expect luxury and relaxation. Bot-minding is the same on a station or ship. But with twelve-hour workdays and five roommates in her cabin, Triana thinks she should have read the employment contract more carefully. Days into the cruise, her boss, Les, goes missing. Triana dusts off her sleuthing skills to start snooping. Together with a retired Marine Corps dance instructor, a socially inept hospitality intern, and her favorite security agent, she must navigate more than just the solar system. They dodge dance competition divas, reality show cameras and the occasional wealthy sociopath to search for the missing supervisor. Will they find Les before she goes dancing through the stars? And will they find time to hit the buffet before all the chocolate strawberries are gone?